Hawaiian food is known for being totally ono (delicious) and foodies on the mainland are catching on fast. 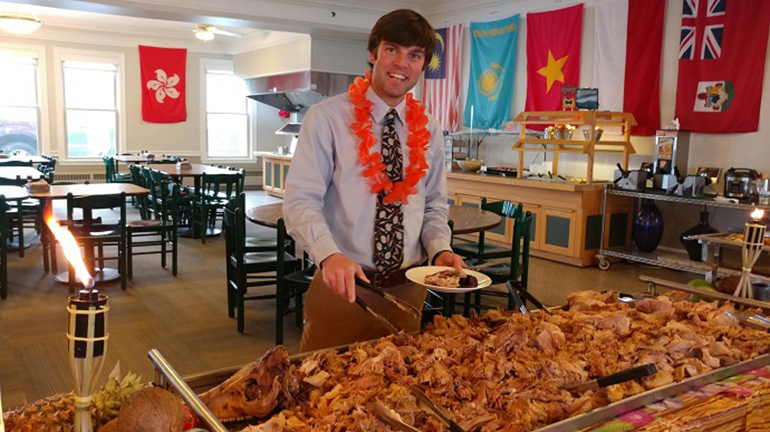 Boston’s brutal winter was interrupted for a few glorious tropical hours in late January with a Hawaiian-themed dinner by the Boston University dining team. Production Manager Mark O’Shiro wrote the menu for the event, tapping into his experience at a Hawaiian restaurant years ago. Hawaiian main dishes (with desserts, left) included togarashi-spiced fish tacos with papaya salsa, barbecue pork sliders on Hawaiian sweet rolls with kale salad and Maui honey vinaigrette, orange/ginger-glazed tofu skewers over coconut rice, hoisin-mango pork ribs with Asian slaw, shrimp linguini with lemon grass broth, gluten-free teriyaki beef kebobs and the “So Ono” burger, with American cheese, grilled pineapple salsa and pink Hawaiian sea salt chips. By the end of the evening, the savvy luau attendees that saved room for dessert had a lot of succulent sweets to choose from: vegan Hawaiian pineapple cake, passion fruit cheesecake and coconut cream haupia pie (a dessert icon of Oahu’s North Shore). 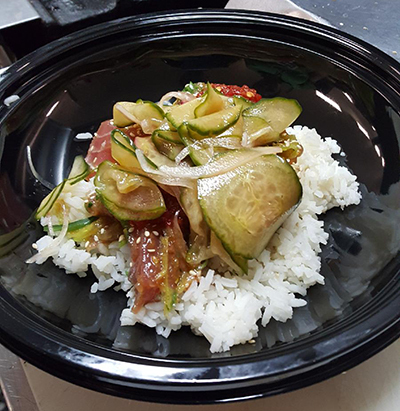 It’s “really unheard of” for the most part, to offer poke in a hospital setting, says John Medall, executive chef for Palomar Health Food & Nutrition Services in Escondido, Calif. “Of course, we are not serving it to our patients,” he explains. But for the retail side, customers have been majorly picking up on poke (pronounced po-kay to rhyme with “OK”). Medall marinates the ahi in soy-ginger sauce, allowing the tangy, umami-rich flavors to marry with the sweet fish, then tosses the pink cubes of ahi with wakame seaweed salad and sunomono cucumber-red onion salad. He tops it off with hot sauce and sesame seeds and serves it on a base of sticky rice. SAGE Dining Services has developed a series of cultural learning/food events called Educational Seasonings. February’s focus is on Hawaii’s diverse melting pot of a cuisine, and it’s a meat-centric barbecue event (below) with smoked whole hog and luau side dishes like tropical fried rice.